WE ARE MOVING THIS BLOG TO THE FISHMAN MARKETING WEBSITE. Please go to fishmanmarketing.com/blog and subscribe to the new location! Personal injury firms have learned that specializing is the way to differentiate themselves and stand out, and they're always looking for new ideas. Previous examples included specializing in things like motorcycle injuries (make sure your speakers are turned on...), dog bites, traumatic brain injuries, cerebral palsy, FELA (a train wreck of a home page), etc. A new one, at least to me, is "Defense Base Act" ("DBA") cases, that is representing "injured employee claims of civilian contractors working outside the United States pursuant to a contract with the United States Government. These claims are covered under the Defense Base Act, which is an extension of the Longshore and Harbor Workers' Compensation Act." 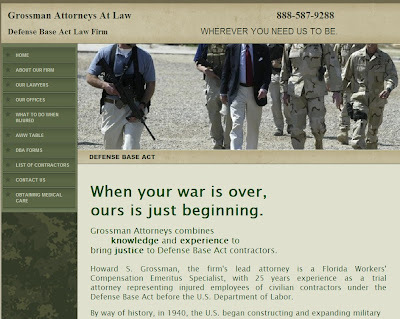 There are apparently many other as well, but here are a couple PI firms that are successfully marketing their DBA practice, Grossman Attorneys (www.defensebaseactlawfirm.com) and Barnett & Lerner (www.InjuredOverseas.com). It's a very interesting marketing idea - I hope they do great work. 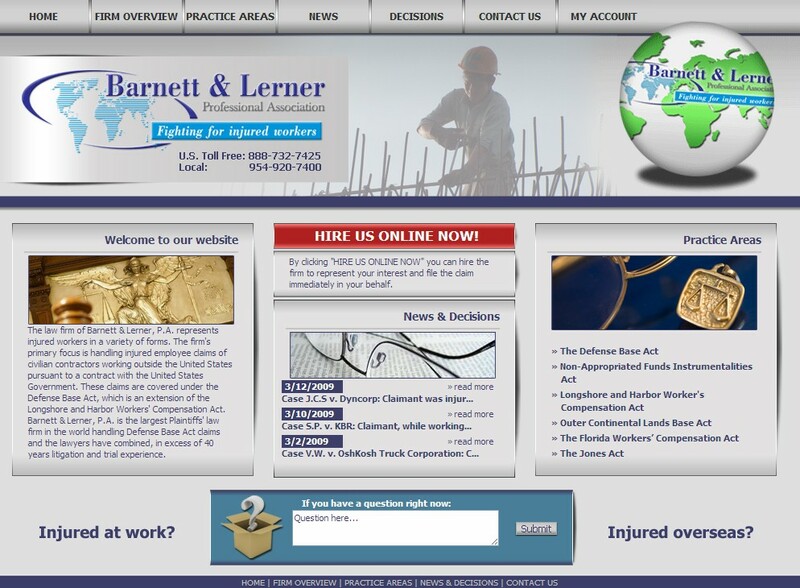 Home page images copyright (c) 2011 Grossman Attorneys and Barnett & Lerner. The 20 Best Law Firm Tag Lines. Is your firm "Committed to Mediocrity TM"? The 10 best holiday e-cards so far. From 6 countries. Abe Lincoln thought marketing was ethical. . . The Worst Legal Industry Ad Ever? Awful law firm names and initials: Small names act bigger. (c) 2012 Fishman Marketing, Inc. All rights reserved. Picture Window theme. Powered by Blogger.